Just a week ago, it was the first day for San Francisco's youth to use their free Muni passes for sixteen months. Sure, it was a joyous occasion for city politicians, advocates for youth, and the kids that qualified for the program, but has angered many (including yours truly) that it's a huge waste of millions of taxpayer dollars. My primary argument: The city and Muni should be spending the several million dollars that is now being used for free rides, and actually using it towards preventative maintenance and maintaining critical systems. So just the day before the release of the new passes for kids, something big came up, a Muni metro's passenger door fell off on the journey between Castro and Church station. 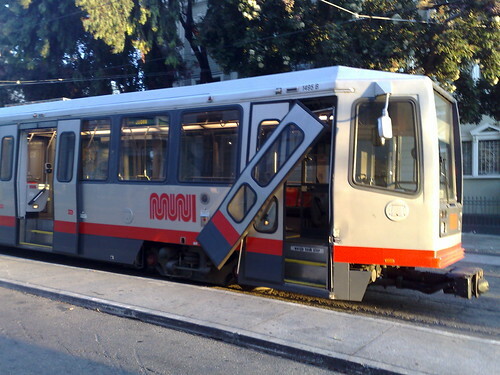 Muni metro vehicle 1439's front door fell onto the trackway, and while passengers were not injured, it sure points out the need for money for maintenance on the agency's aging fleet. I think all that money Muni is spending on free passes for kids is one big joke. If a person got killed from that incident by flying out of that train, the city would be spending a huge amount of dough inspecting every single door. But with an agency still bleeding red, how can they spend money on youth when it should be invested in prevention and repairs? If another transformer blew in the metro system, there would be another metro meltdown because no trains can operate without electricity; I'd rather see the millions spent to maintain and possibly upgrade the transformers so it can help everybody, and not just kids getting a free ride. As I mentioned before: Kids, you should be very fortunate that Muni gives the best discounts out of the rest of the agencies in the Bay Area. You get a 62.5% discount (versus adult fare) with a free transfer, other agencies don't give free transfers or cut the discount to 50% or less. There's no way to cancel the pass program, but I'm hoping the city will realize after the pilot program ends, that it's NEVER RENEWED. Too damn expensive. It's important to note the program's definition of "Low Income." A kid coming from a typical family of 4 qualifies for the "Low Income" free pass if their family income is less than $103,000. Somehow, I don't see the need for providing free Muni Passes to kids coming from families that make over $100,000. For comparison, the federal poverty level for a family of 4 is $23,550. They could give everyone free rides on muni as was proposed a few years back and save on no longer having to deal with farebox operations and fare inspections. Before doing that, the city would need to make sure they were focusing on having a muni system in good repair and able to handle the increased ridership a free system would get.